Once again - another record-setting update, so much new news! What a crazy winter so far! Firstly - Happy Winter Solstice today! (Or summer, down south!). Happy Christmas, Holidays of all kinds, and upcoming New Year! Happy everything! We are on our way up to spend some time up in Kansas City so we can visit with our families over the holidays. As I'll be at my KC studio, I'll still be painting, we'll still be shipping, printing, etc. - all orders will go as usual, no delays. The only potential short delays will be with Masterpiece Edition Canvases (as they are currently hanging in Florida, lol, I'll have to wait to mail those out when we return on January 3rd). Secondly - thank you ALL who came out to my end of year shows at Disney! I already have added a bunch of new events for 2018 up on my Events Page Here - including seven appearances at the Epcot International Festival of the Arts (at which Disney will debut my new "Ursula" prints & merchandise), and for you UK folks I'll be attending Glastonbury's Avalon Faery Fayre March 10-11. New paintings! 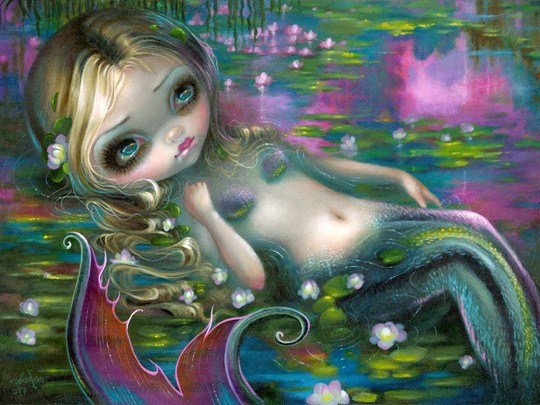 I have some three new paintings to show you from my Mermaids show! "Dumbo Octopus Mermaid" - original painting is AVAILABLE details here , "Monet Mermaid" original has sold, but prints are here , and then we have a tiny original painting called "Miniature Study with Anglerfish" available from the Pop Gallery (call them at 407-827-8200 or email them here, they ship worldwide). All of the other seven originals (including Monet Mermaid) were sold at the show, we just have the mini Anglerfish & the Dumbo Octopus mermaid still available (see photos below! ), and prints of the two larger ones. Hey, I'm on a podcast! I am the special guest this week on the popular podcast "Stories For Nerds" - you can listen beginning tomorrow (Friday, the 22nd) - the episode I appear on is SFN Podcast EpiXode 2.26 and you can listen to it starting tomorrow HERE or download it from wherever you like to get your podcasts. They have an interview with me and then I chime in for the remaining part of the show which is a "year in review" for all things nerdy (books, scifi/fantasy, computer stuff, movies, video games, etc.). Pin news! You guys cleaned us OUT during the holidays this year, "Ruby Dragonling," "Alice in the Starry Night," "Voodoo in Blue," "Pink Lightning," and "Biohazard" pins are all SOLD OUT and are now retired. You bought them all. My friend Paul who runs StrangelingUK may have some of these still left in our British inventory - click here - he is in the UK but ships worldwide, so that's your last chance! Otherwise, you might want to check in at the Strangeling Pin Collecting Group here to see if anybody wants to trade or sell theirs. We do have a NEW pin though this month! 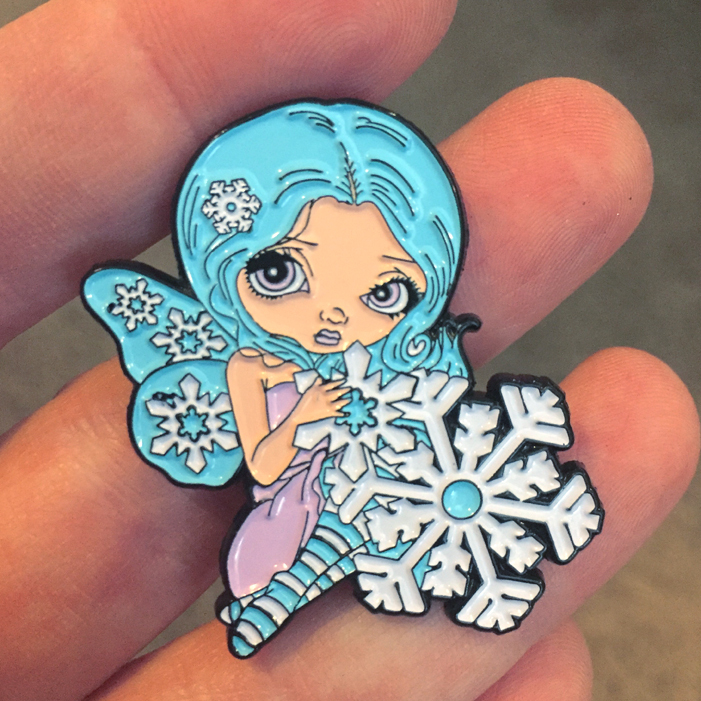 The December Pin of the Month - "Snowflake Fairy" - available to the public for sale here! And we still have some of THEM in stock, lol. And many more to come - you can see all the Strangeling Pins so far here . Alternately too, the best way to stay on top of things is to sign up as a Patreon Pin Collector on my Patreon here. While it's still December you can immediately get the Snowflake Fairy (along with the Patreon-only pin "The Scarecrow" , and the Strangeling lanyard), and you'll get each new Pin of the Month as they are released (along with Patreon-only pins and exclusive bonus pin giveaways, discounts, and more). Speaking of Patreon - we hit our $5k goal - THANK YOU ALL! That was our goal to hire a new fulltime Florida employee (which will open us up to many more exciting things). I really can't thank you guys enough, it will change our lives. I've announced the $6k goal (livestreaming paintcam!) and the $7k goal (giant printers!) up there today too. In fact, I've just posted a bonus Christmas coloring page - "Nutcracker Suite" along with "Winter" as two new Patreon Exclusive downloadable pages - if you are already part of the coloring tier ($5+) you can click here and see all the new pages! Not yet a member? 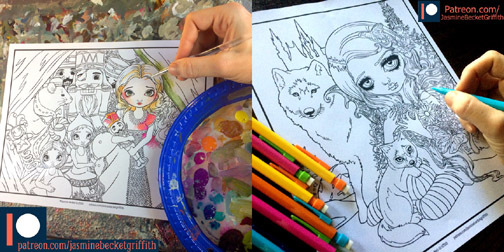 Just $5 lets you immediately download ALL the coloring pages so far, all at once. If you enjoy them, stick around and you'll get new ones as they are added (and of course previews, sneak peeks, behind the scenes content, giveaways including original paintings & more). Simply click the link to Patreon here and click the orange "Become a Patron" button, it takes less than sixty seconds. The clothing company "Spooky Kook" has just launched their amazing "Strangeling" clothing line! Gorgeous dresses, blouses & more featuring my artwork here! They are in the UK but they ship worldwide including the USA. They are reasonably priced (around $30 for a dress!! ), have a fantastic range of sizes - UK 8 - 24, which includes a range of plus sizes too. If you have specific questions about the clothing or sizes please contact Spooky Kook here (I just know about painting, not clothing). Soft, lovely, high quality fabric too, I love it. Whew, and that's it! Now scroll down to see it all! Prints now available from $9.99 here - we ship WORLDWIDE. “Dumbo Octopus Mermaid” is an original painting I did for my December 2017 “Mermaids” show at the Pop Gallery at Disney Springs, and is the only larger piece still available. The Dumbo Octopus is a real creature – one of nature’s most unusual and adorable sea beasties. I saw some footage in a documentary about them and knew I just HAD to paint one, they look simply magical! And of course, being me – I thought he needed a mermaid friend….. We also have limited edition canvases (8x10" only $100, hand embellished, limited edition canvas giclee, only 25 made) and glossy paper prints ($9.99 on sale this week) signed on the back by me. Another painting from my Pop Gallery "Mermaids" show - this piece is inspired by the beauty and fluidity of Claude Monet’s famous water lily paintings. The original painting SOLD at the show, the Masterpiece Limited Editions all SOLD immediately to my Patreon Patrons before they were available tot he public, with the exception of the #5 final last Masterpiece canvas which is up for auction here, but we have prints & open edition canvases available now! "Miniature Study with Anglerfish "
A rare opportunity! One of my actual original mini paintings is available from the Pop Gallery! 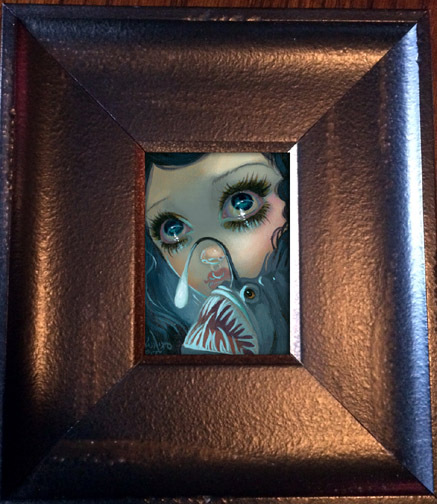 Entitled "Miniature Study with Anglerfish" this is a beautiful original acrylic painting on a panel approximately 3x4" in size, framed in a sturdy deep wooden frame measuring approximately 7x8" (I think, if I remember correctly, it's currently hanging at Disney World). Only $495, email Pop Gallery here, or call them, or stop by their location at Disney Springs (in between the AMC theatres and Splitsville) in person! Pop Gallery will ship worldwide. I've added a couple more new coloring pages is up on my Patreon page here! "Winter" is on your right, and a bonus Christmas "Nutcracker Suite" is on your right. Since these are printable, you can even put them on cardstock or watercolour paper for those of you who want to try your hand at painting (I did it with acrylics and it worked lovely!). Just for my Patreon patrons, it's our newest membership perk! Those of you in the $5+ tier will now get Patreon Exclusive Coloring Pages of my artwork, just for you guys! These will be completely different pictures not found in any coloring books, we're doing them JUST for Patreon. You can sign up for Patreon here, coloring pages are perks for $5+. You'll get all the past pages, current page, and all the future pages (we add 1-2 per month). Already a 5+ Patron? You can always get any past or present coloring pages at this linkhere (or just click the Coloring Page tag under Posts at my Patreon page). And YES, you can sign up now just for $5 and get all seven pages all at once that have already been released, a bargain. You get them all, past & present the moment you sign up. Don't want any more? You can leave at any time. You won't want to though. We have a brand new pin! The December Pin of the Month - "Snowflake Fairy" - is now available to the public for sale here! She is $12.99 and we are happy to ship worldwide. What a little cutie! And many more to come - you can see all the Strangeling Pins so far here . Alternately too, the best way to stay on top of things is to sign up as a Patreon Pin Collector on my Patreon here. While it's still December you can immediately get the Snowflake Fairy (along with the Patreon-only pin "The Scarecrow" , and the Strangeling lanyard), and you'll get each new Pin of the Month as they are released (along with Patreon-only pins and exclusive bonus pin giveaways, discounts, and more). If you are into pins, this is really the best way to go. Just a head's up for you ACEO collectors, I'll be popping up a brand new batch of new ACEO cards up for auction here starting around 7PM EST on Friday, December 22nd. Just bookmark this link here and check back Friday night, you'll see some cards of paintings you have never seen before! As always, bidding on each will start at one penny and we are happy to ship worldwide. I'll be posting several throughout the evening so check back any time after Friday night!